This is another 9×13-inch baking pan recipe, which, in our opinion is one of the most versatile pieces of kitchen equipment in our home next to our slow cooker crock pot. Therefore, if you love carrot cake, you will love this moist and delicious version with the rum soaked raisins and zucchini. TIP: The raisins are soaked in dark rum for at least one hour before mixing into the wet and then dry ingredients, however, for better rum flavor soak them overnight, or to speed up the process the raisins and rum can be heated over a low heat for several minutes, then allowed it to cool at room temperature. 1. Put the raisins in a small bowl and add the rum, allow them to soak for at least 1 hour or overnight (See tip above). Preheat oven to 350° F when using a metal baking pan, or 325° F if using a stoneware or glass baking dish. 2. In a large bowl combine the flour, baking powder, ginger, and baking soda. In a separate bowl combine the beaten eggs, carrots, zucchini, brown sugar, walnuts, oil, honey, vanilla, and the rum soaked raisins. 3. Add the wet mixture to the dry mixture and stir until just combined. Spread the wet batter evenly into an ungreased 9×13-inch baking pan or baking dish. 4. Bake for 30 minutes, or until a toothpick or cake tester inserted in the center comes out clean. Remove from the oven and cool in the pan on a wire rack. 5. While the cake is cooling, combine the softened cream cheese and powdered sugar in a medium bowl and beat with mixer until fluffy and creamy, stir in optional fruit zest. When the cake is room temperature, frost the top then cut into 36 portions. 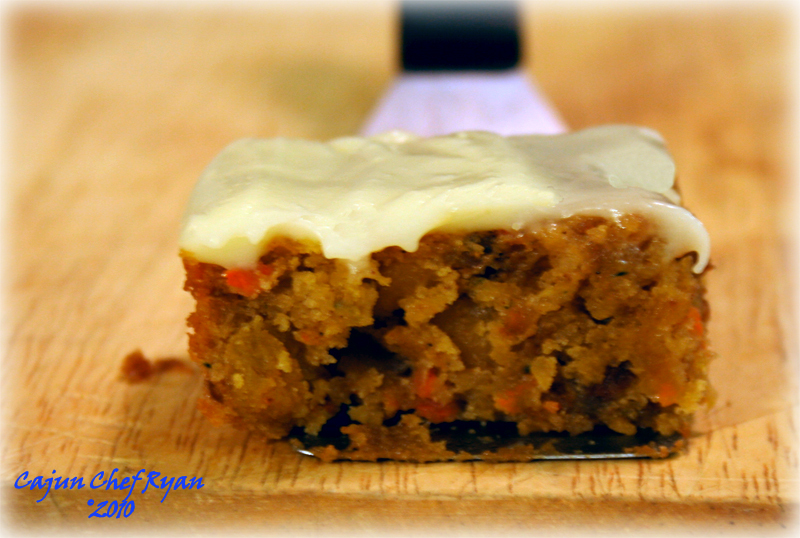 Rum Raisin Carrot and Zucchini Cake…another view! Ooooh my! I adore this recipe! I never knew that you soaked the raisins in rum! So neat! That looks so good!! I always soak raisins when using them in baking or even oatmeal, but have not tried rum yet. 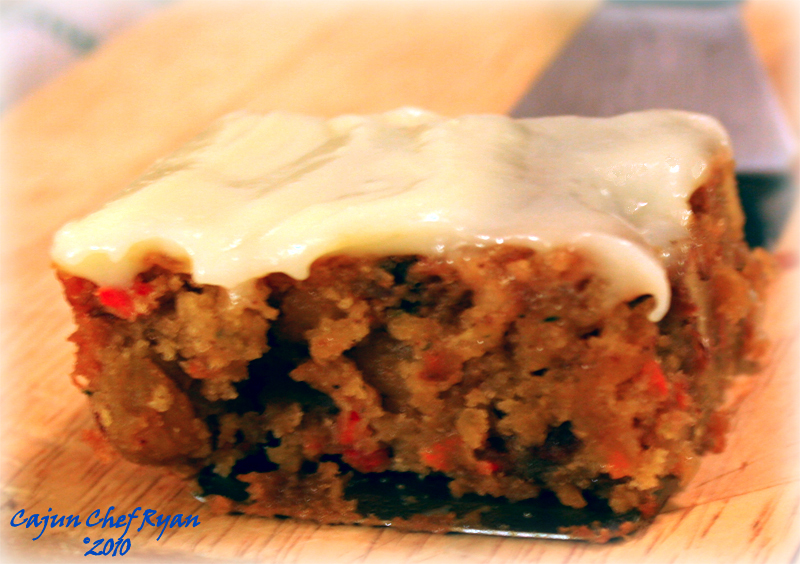 Love carrot cake and zucchini bread, and cream cheese icing – so this one will be awesome. Thank you CajunChefRyan! Wow! What a great twist on traditional carrot cake. YUM!! Yum! Anything with rum is good. Great combination of flavors. Wow, that sure sounds amazing! I wonder how it would taste with Captain Morgan Spiced Rum? one of my favorite anytime! looks delicious and healthy all at the same time who could beat that combination! Looks so good! Keep seeing zucchini in cakes… must bake some soon. FANTASTIC!!! I’m going to make this cake in a couple of days. It looks very moist. This cake will also freeze very well and I would frost the cake later. Rum Raisins are divine. This cake looks fabulous. Definitely my kind of carrot cake. Love the addition of rum which probably keeps the cake nice and moist. The combo of carrots and zucchini together is intriguing. Thanks for sharing. I think the addition of rum-soaked raisins is nothing short of brilliant! Love the addition of rum in the mix. Very yummy! Wow.This looks amazing. I have seen recipes using courgettes in them and I’ve thought they must add moisture like carrots do. After seeing this I’ll definitely be trying some courgette cake recipes! I love cakes in a 9×13 pan. It’s a better frosting to cake ratio. This looks moist and delicious! You, my friend, are a genius. I make carrot cake a lot as it’s always so very popular, and I completely LOVE the idea of soaking raisins in rum for it. Brilliant. The recipe name is a bit of a tongue twister but it sure looks like a taste bud pleaser! Thank you all so much for the wonderful comments! I am sorry that I was not able to respond to your comments individually, but please know that I do appreciate each and every one of you visiting my blog! Oh, this is so much my kind of dessert. Then you mention the raisins taking a nice long bath in rum and I’m all over it. I’ll be making it this week. Thanks Chef Ryan! The rum soaked raisins are amazing, I have to confess, several of them end up in my taste testing before they make it to the batter. Just took my cake out of the oven. The whole house smells divine! This really does look so moist and delicious!